The interplay between literature and the various visual arts—paintings that tell stories, or books that describe paintings, or any other cross-artform conversation—has always been fascinating to me. And being the book lover that I am, artwork based on the written word itself has always captured my imagination, from the Winnie-the-Pooh movies I watched as a kid, to the Sochi Olympics Opening Ceremonies. So when I discovered this “ocean of words” honoring Gabriel García Marquez, from Spain-based creative group Think Big Factory and creative agency Barrabes Meaning, I was absolutely mesmerized. Choosing a particular motif to trace through his work—in this case, the ocean—they set up an intricate multimedia installation involving 10,000 words 3D printed in real time. The speech is about “the power of words in the image era”—a still-relevant concept, especially in the Internet’s zeitgeist of diminished word use and 140-word tweets. It is conceptually, visually, experientially stunning. I love this homage to “the power of words in the image era,” and the role words play in the greater social landscape, which is so evocatively visualized in this ocean. The sense of movement, based off of real-time data of word-use on Twitter, gives me the same sense of wonder as the starling murmurations I was inspired by for one of my favorite school projects. 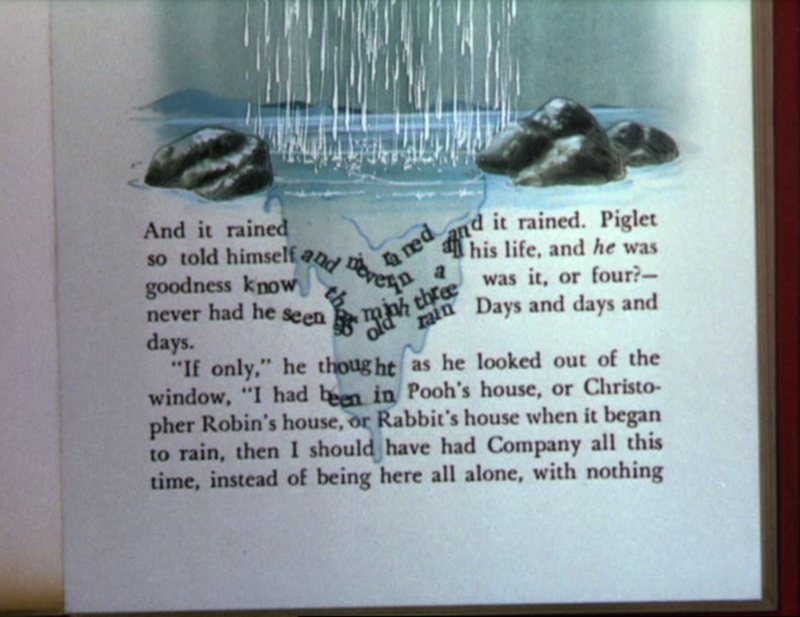 The choice and arrangement of the waves behind the words is affected by the contemporary use of Márquez’s words about water by the general populace. 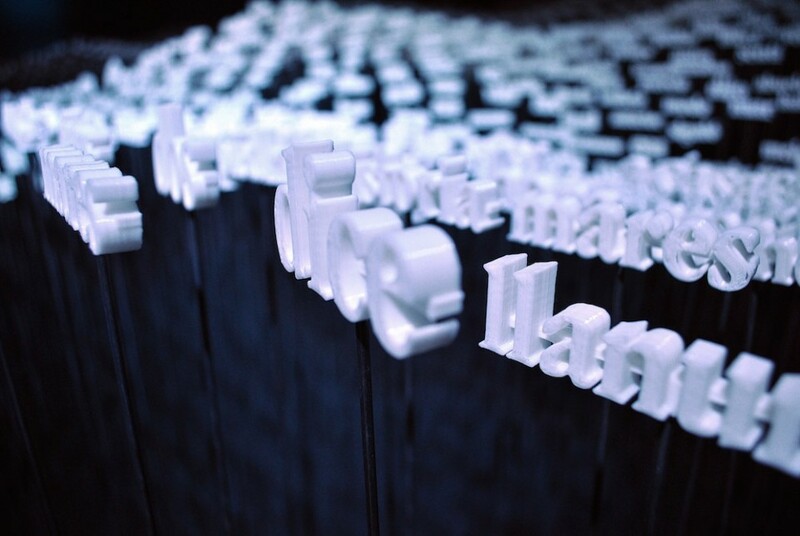 The motion of the 3D-printed words is determined by data extracted from Twitter through a program designed in openFrameworks. 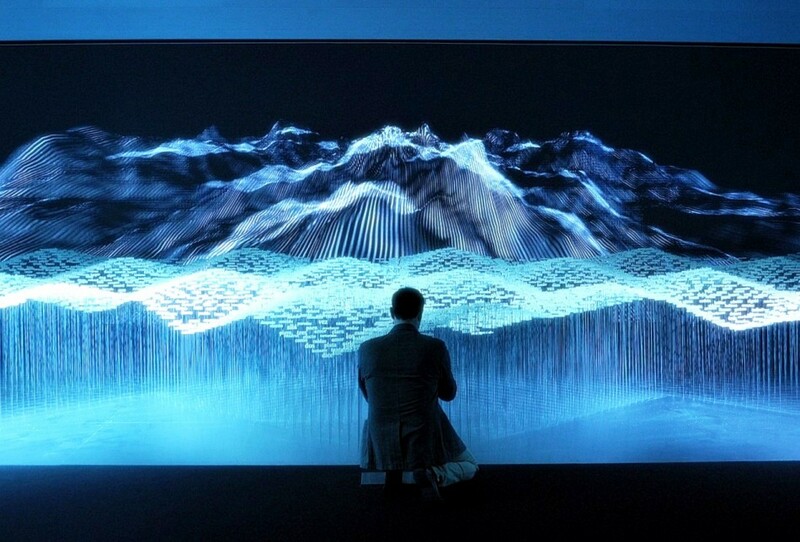 The room, on a larger scale, is a representation of what the creators’ software does, taking the elusive qualities of language and transforming them into a physical manifestation. This is made especially evident through the tirelessly working 3D printers that remain on display, and the words that flow ceaselessly through the room. It is so fitting that this creative exploration, pushing the envelope for the experience of the written word, was done to honor the memory of a man whose writing pushed the boundaries of the believable. 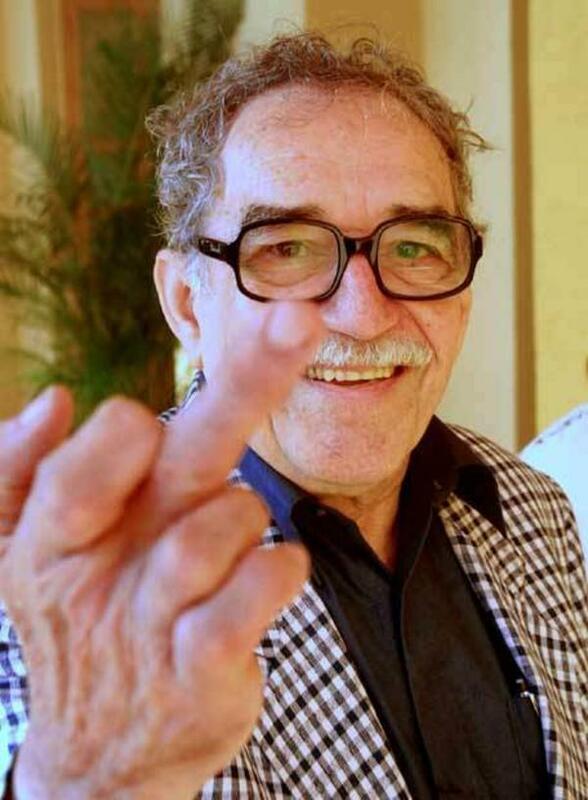 I was fascinated by Gabriel García Marquez’ works, and wrote my own, rather humble, memorial to the man in this blogpost; it is lovely to see that not only will his stories live on, but his ideas will inspire art and conversations like this, still very relevant to our society today. 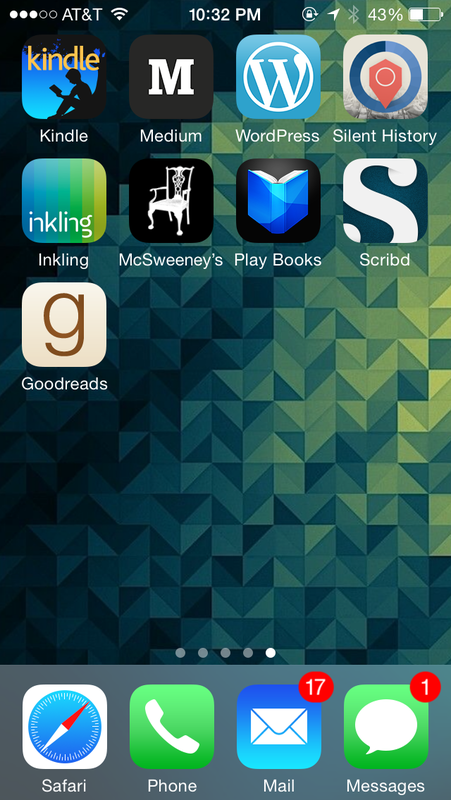 This summer, during an effort to streamline the apps on my phone and organize them in a more coherent way, I decided to finally get rid of my Goodreads app. It made me sad, but honestly, I never used it. Goodreads is one of those products that I want to love. It’s right up my alley, using technology to enhance the reading experience in new ways. It’s focus on the social aspects reading—the shared experiences created by reading books, recommending books, talking about books, and discovering new books, is awesome. I love it. I religiously update my profile online every time I finish a new book. 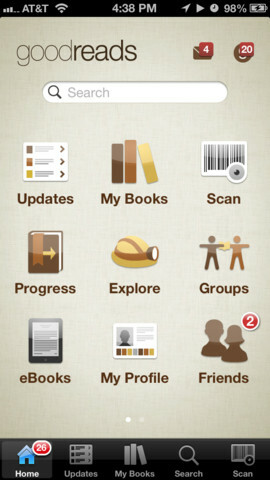 But that Goodreads iPhone app was not great. 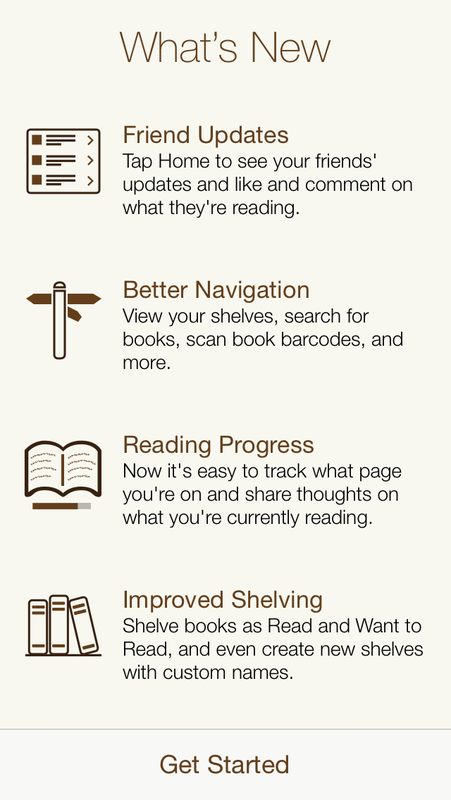 I was really not a fan of their brown-on-brown-on-brown color scheme, and it was kind of clunky to use, with its opening screen taking me from my iPhone homepage to a second homepage of Goodreads app-like icons that seemed to head off into their own worlds. In addition to these icons, there were five navigational options along the bottom bar, and along the top, a Search Bar and Messages and Updates indicators. There were so many options, a lot of which I wasn’t interested in, that it felt more overwhelming rather than enticing me to use it. It didn’t help that the app seemed buggy and was constantly logging me out. Unfortunately they have stuck to their brown-shtick (only so much you can do about branding), but aesthetically I’m a fan of the simple line-icons, layout and clean typography that is much more inline with the new iOS style. Tapping “Get Started” took me to their new Home screen which is perhaps the best improvement in the new app—instead of a landing page of “app” icons, I was immediately shown content in the form of a newsfeed. This is similar to the Goodreads website experience, and makes so much sense, as it is bringing the focus of the app back to social activity. Outside of the new Home screen experience, a lot of the functionality has been simplified to focus on key interactions, but remains fundamentally the same. Previously there were five icons along the bottom,and now there are four: Home (the Newsfeed), My Books, Search, Scan, and More (which hides all the extra less-frequently-used functionality previously found on the homepage). At the top of the screen, the Messages and Updates notifications have been removed, leaving only the Search Bar. Even this is a little unnecessary, considering that there is also a Search Icon on the bottom, and I might be tempted to get rid of it, perhaps replace it with some sort of title or branding. All in all I think this redesign has made a significant difference to the app experience. Goodreads hasn’t done anything groundbreaking or really actually exciting from a design perspective. What is exciting about it is that they’ve *finally* released a redesign that is a significant improvement over their previous app design, and they did a pretty good job with it. It has definitely increased the usefulness of the app for me, resulting in it once again earning a place in the reading section of my phone. A great man died today. 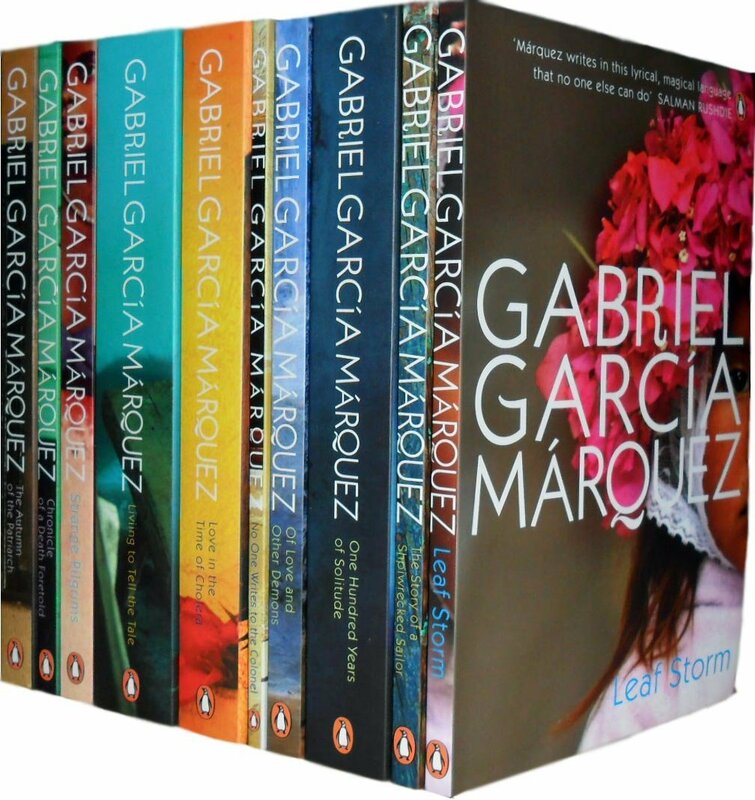 Gabriel García Márquez gave the world some amazing stories—stories filled with imagination and poignancy, that blurred the line between human reality and the fantastically impossible. 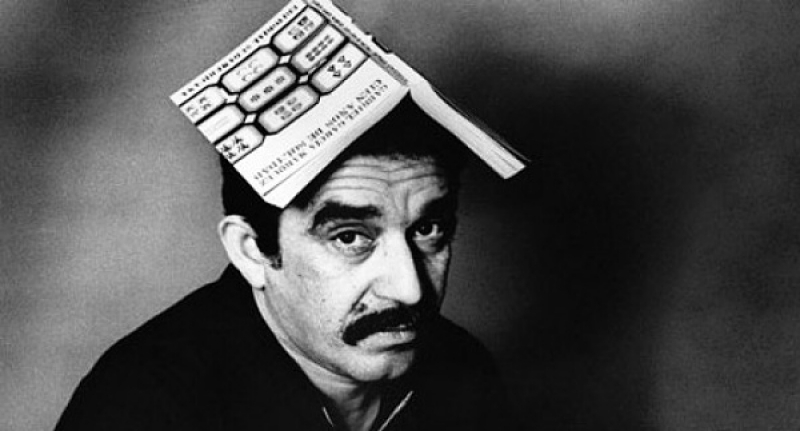 While I can’t call One Hundred Years of Solitude or Love in the Time of Cholera my absolute favorite books, those stories captured my imagination and stuck with me far longer than most, and they left their mark on our culture. I’m in the process of putting together my final portfolio for my MFA and looking around for ways to communicate my design beliefs, so I’ve been reading a lot more quotes than usual. There are two that have really stuck with me, one that speaks to the sheer delight and amazing capabilities of books and another that speaks to the purposeful nature of design, and I like them so much I thought I’d share. That quote just gets me. It really captures how truly incredible books are. I remember thinking a very similar thing (albeit not quite so eloquently) in high school when I was reading Plato’s Apology. Our class was carefully analyzing the subtle points of Plato’s logic, and I remember sitting back for a second and thinking, This guy has been dead for 2,300+ years, more time than I can really grasp, and yet his thoughts are here, today, in this book in front of me. So many people have thought about and debated his ideas for literally millenia, ever since he originally wrote them down. How crazy is that! And the designer in me today loves Sagan’s description of writing—”lots of funny dark squiggles.” So often people overlook the importance of typography because they take it completely for granted that these black shapes on a page, or on a screen in our case, have a meaning that is decipherable to people. How did a circle become the letter “o”, that can be used next to two perpendicular lines (“t”) to create a word “to” that has so many meanings and helps hold sentences together? It’s amazing, when you sit down and really think about it. 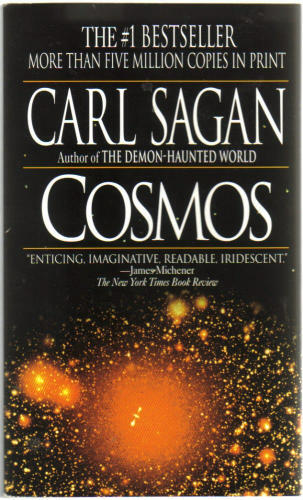 But one thing to remember is that quote by Sagan was from his 1980 tv show and book, Cosmos, when there was no such thing as a Kindle, an iPad, or an ebook. The first personal computer was released by Apple in 1984, and the great wave of technology that has completely changed the shape of reading has all come since Sagan originally described the magic of books. So I hope he’ll forgive us if we take the liberty of expanding the meaning of his quote to refer to the many different ways that thoughts are expressed by their authors and conveyed out to the greater world. Today, that amazing ability is accomplished not just by “a flat object made from a tree with flexible parts” but also by screens of all shapes that support ebooks, and really the very many different reading and publishing platforms available, including this post published on the internet via WordPress. We could argue about whether platforms like Twitter, which allow people to author only very concise “books,” should be included, but if you are willing to admit Hemingway’s famous six-word story (“For sale: baby shoes, never worn.”) counts, then I think Twitter must also be included. You could argue that really what captured Sagan’s imagination and appreciation is the longevity of the thoughts in the form of a book, and how they can connect people from distant epochs, and therefore today’s technology doesn’t count as it will probably not be accessible 2,000 years from now. In fact, its a pretty safe bet that even 20 years from now technology will have so thoroughly changed that many things will no longer be accessible (floppy disk, anyone?). But not all writing has lasted that long, and many authors works have been lost over the centuries. It’s always been a process of saving and passing along only the best works of literature, and that is the same challenge we face today, just with a much larger magnitude of written work. So I, for one, would like to extend Sagan’s wonder at books and the power of written communication to include the many different innovative forms of ebooks and digital communication popular today. 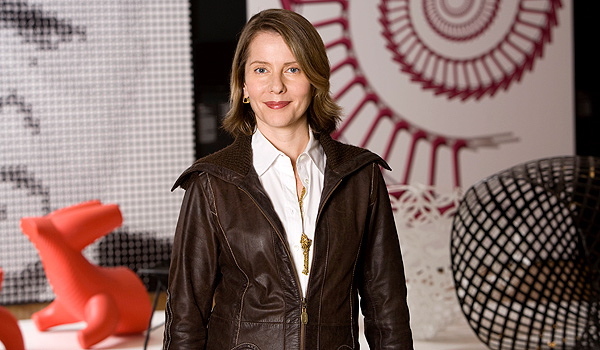 The second quote by Paola Antonelli is related, but talks about design as a whole, and how design is fundamentally about caring how something works, not just what it looks like. In relationship to books, this mean that it’s all well and good if the cover looks great, but fundamentally what’s important about the design of a book is how the format of the book accomplishes its goal, namely, getting someone to pick it up and be able to read and understand it. 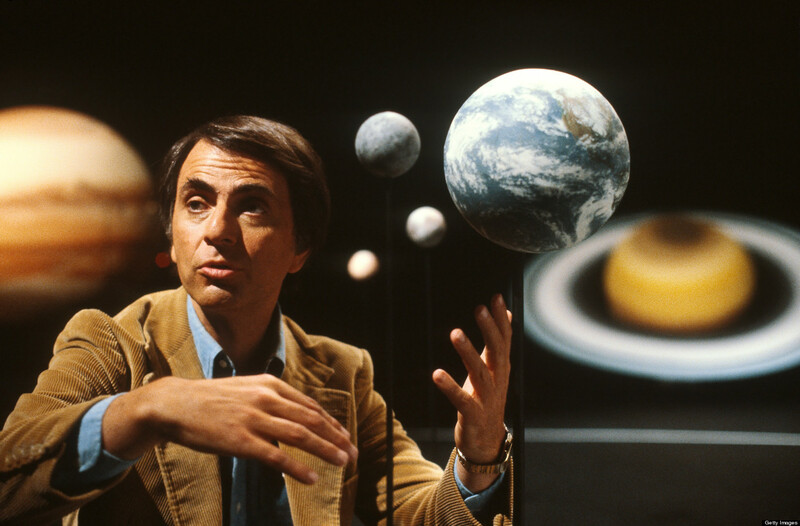 To enable what Sagan loves: “across the millennia, an author is speaking clearly and silently inside your head, directly to you.”It means, for ebooks, that all the flashy interactivity in the world is useless, and in fact detrimental, if it doesn’t somehow serve to improve the reading experience. What a lofty, and yet worthwhile challenge! Could a designer ever hope to accomplish anything better than to give the world something it didn’t know it was missing? What Should a Book Cover Be? Obviously, a book cover needs to provide structure and protection for the book. But what is the purpose of the design, and what does the design have to say about the story within it? The artwork on the cover could be anything, really. The cover could have people on it, such as the protagonist, or an abstract figure, or crowd of people who belong in the world of the story. It could have an object that relates to the title or the storyline. It could convey a sense of the story through typography only, choosing a typeface and way of setting the type that conveys the time period or mood of the story. It could depict an environment or building from the story. Or it could have an abstract image or pattern that conveys the mood and general atmosphere of the book, or the cultural setting and traditions. Depicting the environment of the story. With so many possibilities out there, the question that we sometimes forget to ask is not what can a book cover be, but what should it be? 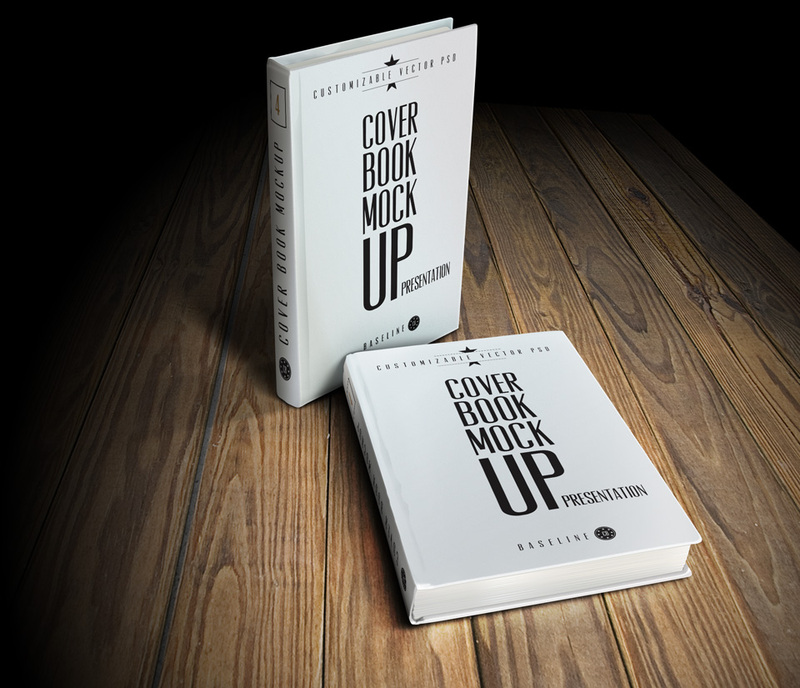 Continue reading What Should a Book Cover Be? Posted on January 29, 2014 February 12, 2014 Categories Graphic Design, Literature, Printed Book DesignTags aesthetic sense, Anna Karenina, book cover design, cover designer, David Pearson, purpose, reading12 Comments on What Should a Book Cover Be? I’ve written a number of posts on design for adult and young adult books, but I’ve yet to feature any books for younger audiences. However, I recently discovered that a few famous graphic designers have made their own children’s picture books, which approach youthful subjects with really beautiful composition and color. 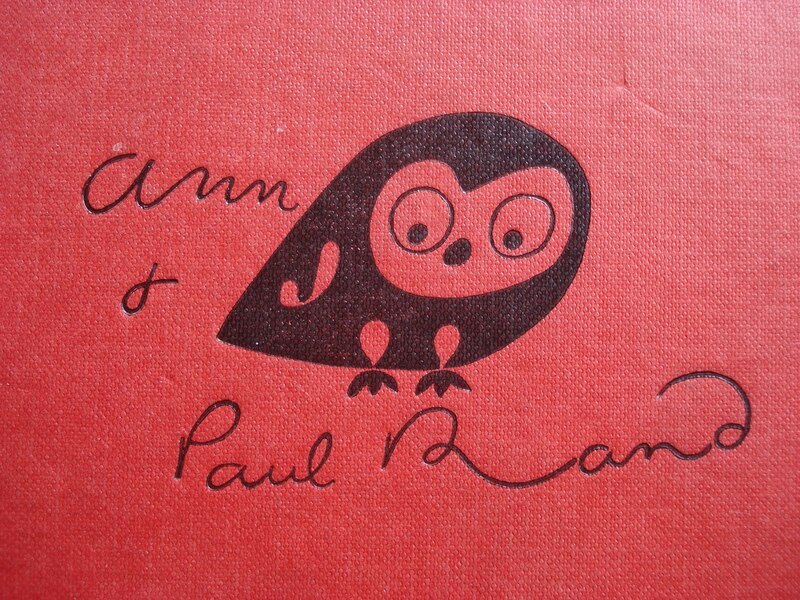 One of the most notable authors is probably Paul Rand, who illustrated books written by his wife Ann Rand. Paul Rand is perhaps best known for his logos for ABC, UPS and IBM, and some of his advertisements and posters. While Rand spent most of his life designing for adult audiences, his aesthetic has a simple, colorful, bold look that works really well in children’s books. The Rands’ children’s books include the three I’m sharing below, Sparkle and Spin: A Book About Words, I Know a Lot of Things, and Little 1. The books have different topics and slightly different visual styles, but are all recognizably Paul Rand’s aesthetic. The text of the books also has a lot of fun word play, from the number puns in Little 1 to playfully illustrated homophones in Sparkle and Spin.